I didn't sleep much last night. 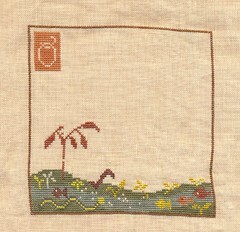 I stayed up until 11 something stitching VOHRH. Dh got home from work around 2 something and woke me up. I couldn't get back to sleep until 3 something. I then had to wake up at 5:30 am to take dh to the airport. I decided to book his flight in Birmingham because it was $200 cheaper. Big mistake! I'd gladly pay the $200 to not have to drive five hours in one day. What was I thinking?? I was thinking it's only 2 1/2 hours to get there... but I wasn't thinking it's also 2 1/2 hours back. Oh well, live and learn. Construction traffic made it very slow going on the way back. Hopefully it's not as bad Tuesday when I go to pick him up. Oh and another thing! I decided I would visit a cross stitch shop while there. Anything Stitched sounded like a good shop to check out. Well, I went to a fabric website that had the address and mapped it out. When I got there it was residential and not the correct address at all! I was very upset at myself for not rechecking the address, but I just assumed it was correct. That's what I get for assuming!! Oh well, live and learn once again!!! I took a picture with my camera - with flash, without flash, and finally decided to scan it and the colors are the truest with the scan. 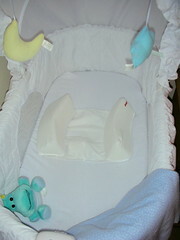 I've got the bassinet all ready for baby! I put it in my room and filled the bottom with blankets and diapers and wipes. Just need the baby now! Well, I'm off to bed! Hopefully to get a good, long nights sleep! I won't have many of those left! :) Write later! Hey Nicole, you are amazing! I love your work on VOHRH and can only commiserate with you about the lack of sleep (it's too warm here to sleep decently). Don't know where you find the energy to do all that you do. Hope you'll get some sleep tonight. Wow, you have made some great progress on VOHRH. The colors are so pretty IRL. Your stitching looks amazing. Now forgive me, but what is it that is in the middle of the baby's crib? 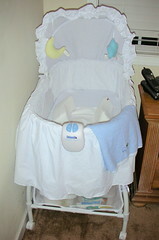 Ooh - the bassinet looks so cozy and soon it will be filled with a beautiful baby!